Logs tracks events that take place in your store. Logs provide the history of the events in your store determining when it took place, by whom and other information. The includes events like action performed on products, orders, payment transactions, themes, settings, and notifications etc. 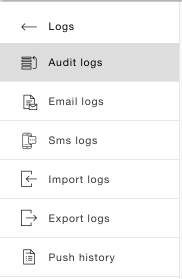 You can access logs in Logs section in StoreHippo Admin Panel. Audit logs keep track of the changes that are made to the store. Each record includes a brief summary describing the event, when it happened, who made the changes, etc. Email logs keep the history of email notification sent. It contains the details like email, email id, etc. SMS logs contain the history of the SMS notifications sent. The record includes the information like the phone number on which the SMS is sent, message, when the message was created, sent data, etc. Import logs allow you to keep track of the import records. You can view the all the imported file details here. Export logs allow you to keep track of the export processes in your store. You can view the exported file as well as its details in this section. Push history allows you to keep track of the push notifications sent. It contains the history and all the details about push notification.